Construction costs in Australia remain stable compared to the rest of the world with Sydney rated as the most expensive place in Australia to build, according to Turner & Townsend's International Construction Market Survey 2017. Sydney is now positioned at number 9 with New York taking the number one spot for the most expensive place to undertake construction activities in the 43 markets surveyed. The 2017 survey also ranked Brisbane at 22, Melbourne at 20, while Perth took 21st spot. 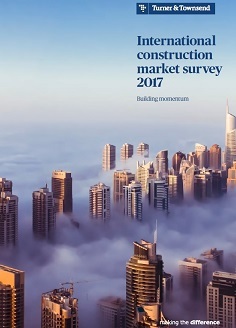 The International Construction Market Survey 2017 analyses input costs "" such as labour and materials and charts the average construction cost per sqm for both commercial and residential projects. Gary Emmett, Senior Economist from Turner & Townsend Australia & New Zealand comments: "The report shows that globally construction costs are reasonably well contained with Australia showing little variation, apart from the Perth market which is a cold market with falling costs (moving from 21st to 18th spot). The improving commodity prices are set to help resources countries like Australia benefit from higher commodity export royalties. This in turn will provide confidence to invest especially in further infrastructure. "Low interest rates have encouraged strong growth in domestic apartment construction markets in several regions worldwide, especially Australia. Looking forward, Brexit and the election of President Trump may add some uncertainty to some construction markets, however the Australian government is committed to its $75 billion infrastructure spend over the next ten years." "The recent announcement by the Federal government to build Badgerys Creek airport and the Inland Rail project adds further strength and commitment to the construction market in Australia," Mr Emmett added. "The report emphasizes the need for further improvements in productivity. Twenty-three of the 43 regions, including Australia indicated that they were experiencing skill shortages as the workforces age and fewer school leavers enter the construction labour force." The surveys over the past three years (2015 "" 2017) highlight there has been a massive upswing in residential apartment construction on the East Coast which is now coming to an end, except in Sydney. This period has seen construction costs increase a little above general inflation. Construction costs on average are up 5.5 per cent over three years, whereas price inflation is up only 3.5 per cent over three years. Sydney residential construction spend has grown by 54 per cent since the 2015 international report. Over the same period construction costs are showing an average 9 per cent increase, while non-residential construction (hotels, offices and retail) activity increased by only 6 per cent. The Melbourne residential construction market grew by 34 per cent during the same period, showing an average cost increase of 4 per cent, while the non-residential market activity fell by 1 per cent. Brisbane's residential construction market grew by 50 per cent, showing an average cost increase of 8 per cent. The non-residential market activity fell by 2 per cent. Perth's residential construction market fell by 13 per cent, construction costs increased by 1 per cent and non-residential construction activity fell by 18 per cent. Mr Emmett added, "The question is what comes next after the apartment boom? Some of the shortfall will be met by major infrastructure projects including Badgerys Creek, Cross River Rail, Inland Rail and Snowy Mountain Hydro phase 2. The time is now ripe to capitalise on the apartment boom slowdown and use the resources (cash and labour) to boost Australia's infrastructure projects and keep the economy strong. "Global construction costs are set to rise by 3.5 per cent in 2017, reflecting steady growth in the global economy but also increasing labour shortages and low productivity within several key markets. The main exceptions to this rule lie in commodity reliant markets where falling prices for raw materials have contributed to a cooling in construction cost inflation," Mr Emmett said. "Major investment is needed to address the growing construction skills shortage which is becoming acute in a large proportion of international markets, leading to hikes in labour and project costs." "Against a backdrop of rising cost inflation and labour shortages, policymakers, contractors and clients in all markets need to tackle low productivity, embracing innovative technologies, new methods of construction, as well as using data and better programme management to boost input," Mr Emmett concluded.